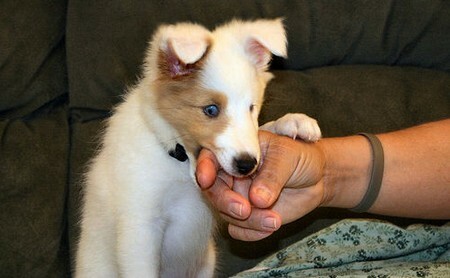 If your puppy gets surprised when you try to approach him then there may be a possibility of deafness in him. Try to approach him from his back very slowly. You should be slow but not quiet. If the puppy turns his face to you, then he is not deaf. But if he doesn’t turn his face until you touch him coming nearer then he can be deaf towards you. Puppy moves on your call by listening to you as well as by your actions. If you’ll call him in front of him, he’ll surely come to you. Try to call him from any other room. If he is deaf he will not come to that room. If he rushes to the room then he is not deaf. You can also know about your puppy’s hearing from his mood. If you see that he is getting irritated from something without any reason then he might be suffering from deafness. This is because these little creatures are always sweet and their mood is most of the time happy. But when they cannot understand any particular thing, due to deafness, they get irritated. If you have any confusion about your puppy’s health, you should consult a veteran. He will thoroughly inspect your puppy and will be able to find the problem. The above given methods will help you figure out the problem of your puppy. You would be able to tell if your puppy is hard of hearing or not! Once you know that he is deaf, you have to take special care of him. You have to train him differently as he is not like ordinary dogs. You should also visit your veteran regularly. He will also tell you the ways to train your puppy according to you. Your pooch is deaf; this doesn’t really matter. You can still have fun with him. If he has got the perfect training from you then it would be fun for him too.